Avast! Teaser Trailer For Teenage Mutant Ninja Turtles. Posted on March 27, 2014 by Big Red	in Movie Booty, Trailer Booty and tagged megan fox, michael bay, teenage mutant ninja turtles, tmnt, tmnt trailer. Here’s your first official look at the Michael Bay produced movie Teenage Mutant Ninja Turtles. There’s been a fair amount of fanboy dread over this reboot but then the film is about four oversized mutant talking turtles who eat pizza and fight crime. Michael Bay Lost It At A Sony Press Conference. Posted on January 8, 2014 by Big Red	in Funny Booty, Movie Booty and tagged las vegas, michael bay, michael bay meltdown, movie director, movie news, samsung, samsung ces. Swashbuckling director and manly scarecrow Michael Bay recently suffered a bit of a meltdown during Samsung’s CES conference in Las Vegas. America’s answer to Peter Stringfellow was due to explain to the gawping public just how amazingly amazing Samsung’s new TV is, apparently it has some sort of curve and is really big and their hope is that viewers will actually think they are in the movie they are watching, when in reality there just sitting on their couch in their underpants, gently sobbing into their bowl of stale cereal. As you can see from the video above Bay loses track of what he’s saying very quickly, (like I did when he mentioned that he creates ‘visual worlds so beyond everyone’s normal life experiences‘), he blames the telepromoter for his hiccup, but the visual explosions and scantily clad women which continually inhabit the great man’s head prevented his brain from producing speaky words and so he strides off stage. In the words of a great, dead man: ‘You done fucked up.‘ How’s that for a normal life experience Michael? Trailer For Michael Bay’s Pirate TV Series. Posted on October 15, 2013 by Big Red	in Trailer Booty, TV Booty and tagged black sails, black sails trailer, michael bay, pirate tv series, pirates, starz channel, tv series, tv shows. Here’s the first official trailer and look at the new Michael Bay produced pirate TV series called Black Sails. It begins in January and will be shown on the American Starz channel, but no word yet which UK channel will pick it up over here. Apparently work has already begun on a commissioned second series. Black Sails focuses on Captain Flint 20 years before the events of Traesure Island take place and will be set in New Providence a corner of the world described by series creators as a haven of pirates, thieves, prostitutes and fortune seekers….much like Los Angeles. Avast! Red Band Trailer For Pain & Gain. Posted on March 29, 2013 by Big Red	in Trailer Booty and tagged film trailers, mark wahlberg, michael bay, movie trailers, PAIN & GAIN, pain & gain trailer, the rock. Here’s the sweary trailer for Michael Bay’s new movie Pain & Gain, starring Mark Wahlberg and The Rock. It looks like Bay is trying really hard to do a Coen Brothers movie but with added strippers and explosions. The movie claims to be based on a true story. The reality of this claim is the real story is far more dark and disturbing than this laugh-fest caper would suggest and involved three men known as the Sun Gym Gang. You can read the whole sordid story HERE. Avast! Trailer For Pain & Gain. Posted on December 29, 2012 by Big Red	in Trailer Booty and tagged film news, mark whalberg, michael bay, movie news, pain & gain trailer, the rock. Oh body builders, what are you like? Here’s the trailer for Michael Bay’s testosterone fuelled movie loosely based on a true story, starring The Rock and Mark ‘I used to beat up defenceless grocery store owners in my youth’ Wahlberg. By ‘loosely based’ they probably mean the end credits have more accuracy. What’s That Smell? Just The Rock…Cooking. Posted on April 29, 2012 by Big Red	in Movie Booty and tagged film news, mark wahlberg, miami new times, michael bay, movie news, pain & gain stills, pain and gain movie, the rock, the rock publicity shot. 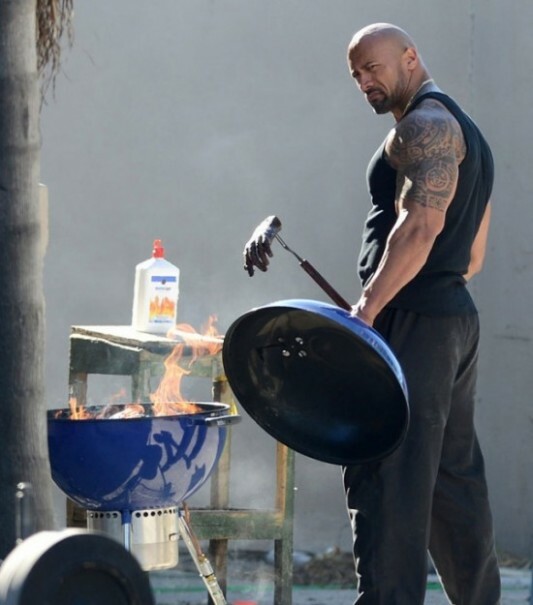 This, unfortunately, isn’t a paparazzi snap of Hollywood action star The Rock relaxing in his backyard using his barbecue. It’s a publicity shot featuring Dwayne Johnson on the set of his latest film Pain & Gain. Directed by Michael Bay the movie also stars Mark Wahlberg and is based on an 11 year-old newspaper article in the Miami New Times about two steriod abusing bodybuilders who had turned to crime and ended up involving themselves in an extortion ring and kidnapping plot which all ended rather messily. Of course the movie is taking a black comedy route with Rob Corddry, (Hot Tub Time Machine, Cedar Rapids), and Ken Joeng, (The Hangover, Community), no doubt propping up the laughs department.